This season on "American Idol," there’s a huge question looming around Adam Lambert. No, not that one. The one about whether this season would have been as exciting had he not been a part of the show. Love him or hate him, Lambert has added an element to the competition that has been woefully lacking in seasons past: a contestant so unique that you can’t wait to see what he will pull next out of his bag of tricks. Regardless on how the season concludes, with Lambert being named “American Idol” or losing the title to competitor Kris Allen, it’s obvious that a star has been born, and we all got to watch. “I don’t think there would be nearly the interest that there is if it weren’t for Adam,” said Brian Mansfield, who blogs about the show for USA Today. 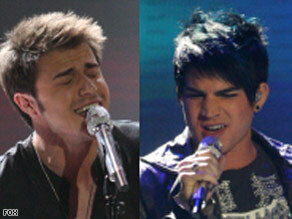 “Really, all season long it’s been Adam and the rest of the field, and is there anybody in the rest of the field that can beat Adam.” Read and watch the best “Idol” performances » Indeed, the talent level for “Idol’s” 2009 edition has been fairly high. Once upon a time, the show plucked apparent unknowns from auditions and thrust them before millions of viewers for a ready-made career. Now, “unknown” has become a relative term as more contestants like Lambert, who toured with a production of “Wicked,” have shown the polish of veteran professionals. But not everything has worked at a high level. The show’s ratings have declined a bit from unbelievable to simply juggernaut. And then there’s the tried-and-true format, which producers attempted to mix up a bit this season. Among the changes: more semifinalists — and fewer semifinal performance shows. That meant viewers didn’t have the opportunity to see the contestants perform more than once. At least a few felt cheated. “It’s a situation where they get who they want to get, and they pimp those people, which takes away from some of the really good singers,” said “Idol” fan Ricky Hoggard Hollman, who gained fame during season six for correctly guessing the top 24 semifinalists. This season’s robust group of 36 contained some fine potential finalists, Hoggard said, but he believed it wasn’t a level playing field partly because producers chose to focus more on back stories than talent. There was also the addition of a fourth judge, Kara DioGuardi, to the longtime triumvirate of Simon Cowell, Randy Jackson and Paula Abdul, which in the end added nothing but time. Producers also added a “judges’ save,” which became a throwaway. Much of the criticism has fallen on DioGuardi, a Grammy-nominated songwriter who was supposed to bring a fresh and informed perspective. Instead, she brought uninspiring critiques, some crazy costumes based on the week’s theme and the magical ability to force Abdul into a few weeks of coherent comments. Even Cowell wasn’t acting like the Simon we have come to alternately adore and want to shake a finger at. He engaged in juvenile antics with Abdul (at one point drawing on her face) and at times stared into space with such complete boredom that you wondered whether Susan Boyle’s “Britain’s Got Talent” performance had forever altered his state of consciousness. “Simon has shown a level of disinterest and a level disdain for the show that I think is kind of alarming,” said Michael Slezak, who writes about the show for Entertainment Weekly. “We sort of expect Simon to speak for us as viewers. We expect him to be up-front and honest and the voice of reason, and he’s just been completely disinterested. “I think it’s disrespectful to the contestants, and I think even more so it’s disrespectful to us as viewers,” Slezak added. “For better or for worse, and crazy or not, we take this show and what’s happening up on that stage seriously. It’s our escape from reality for the week.” And boy, do viewers take it seriously. iReport.com: Who do you want to win As CNN.com’s regular “Idol” blogger, I have never been more lambasted — pardon the pun — than on the weeks I have dared to give Adam Lambert anything less than a flawless critique on the “American Idol” blog. My sanity has been questioned. So has my nationality. (Hey, critics: My last name is “France.” It’s not the location of my blog posts.) Question Lambert’s ability, and the Lambs — his devoted fans — come out in force. I haven’t been completely sold on Lambert. He can be over the top with the dramatics, and the way his tongue hangs out during certain notes is, frankly, bizarre to me. Yet, for all of his antics, Lambert is unbelievably interesting to watch. It took me a while to warm up to him, but with Lambert, I wanted to watch if for no other reason then I didn’t want to be left out of the watercooler conversation the next day. He was the pathway that allowed me to also fall in love with Allen’s musicality, Allison Iraheta’s mature-for-her-years voice and Anoop Desai’s determination to be the first Indian R&B star. I was able to cheer Scott McIntyre’s persistence, jeer the lack of the use of the judges save for Alexis Grace and puzzle over Megan Joy’s quirky performances. Whatever happened to ‘American Idol’s’ Mandisa?